The Dietary Guidelines for Americans (DGA), 2010 encourage Americans, including youth, to increase their consumption of fruits and vegetables. Individuals are encouraged to “eat a variety of vegetables, especially dark-green and red and orange vegetables.” Fruits and vegetables are sources of many under-consumed nutrients and consuming fruits and vegetables is associated with a decreased risk of chronic disease. A new NCHS report examines the percentage of youth aged 2–19 years who consumed fruits and vegetables on a given day in 2009–2010, using data from one 24-hour dietary recall interview. More than three-quarters of youth aged 2–19 years (77.1%) consumed fruit on a given day. Almost 92% of youth aged 2–19 years consumed vegetables on a given day. 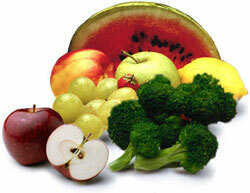 Nine out of 10 children aged 2–5 years consumed fruit, while only 6 out of 10 adolescents consumed fruit on a given day. More children aged 2–5 years than adolescents consumed vegetables on a given day. NCHS has provided a new report on national estimates for indicators of health-related behaviors, health status, health care service utilization, and health care access by sexual orientation using data from the 2013 National Health Interview Survey (NHIS). NHIS is an annual multipurpose health survey conducted continuously throughout the year. Analyses were based on data collected in 2013 from 34,557 adults aged 18 and over. Sampling weights were used to produce national estimates that are representative of the civilian noninstitutionalized U.S. adult population. Differences in health-related behaviors, health status, health care service utilization, and health care access by sexual orientation were examined for adults aged 18–64, and separately for men and women. Based on the 2013 NHIS data, 96.6% of adults identified as straight, 1.6% identified as gay or lesbian, and 0.7% identified as bisexual. The remaining 1.1% of adults identified as ‘‘something else,’’ stated ‘‘I don’t know the answer,’’ or refused to provide an answer. Significant differences were found in health-related behaviors, health status, health care service utilization, and health care access among U.S. adults aged 18–64 who identified as straight, gay or lesbian, or bisexual. In 2011, age-adjusted rates for deaths from drug poisoning varied by state, ranging from 7.1 to 36.3 per 100,000 population. In 17 states, the age-adjusted drug-poisoning death rate was significantly higher than the overall U.S. rate of 13.2 deaths per 100,000 population. The five states with the highest poisoning death rates were West Virginia (36.3), New Mexico (26.3), Kentucky (25.0), Nevada (22.8), and Utah (19.5). Excessive screen-time behaviors, such as using a computer and watching TV, for more than 2 hours daily have been linked with elevated blood pressure, elevated serum cholesterol, and being overweight or obese among youth. Additionally, screen-time behavior established in adolescence has been shown to track into adulthood. The National Heart, Lung, and Blood Institute-supported Expert Panel and the American Academy of Pediatrics recommend that children limit leisure screen time to 2 hours or less daily. A new report presents national estimates of TV watching and computer use outside of the school day. Nearly all (98.5%) youth aged 12–15 reported watching TV daily. More than 9 in 10 (91.1%) youth aged 12–15 reported using the computer daily outside of school. In 2012, 27.0% of youth aged 12–15 had 2 hours or less of TV plus computer use daily. Among youth aged 12–15, girls (80.4%) were more likely to use the computer 2 hours or less daily when compared with boys (69.4%). Fewer non-Hispanic black youth aged 12–15 (53.4%) reported watching 2 hours or less of TV daily than non-Hispanic white (65.8%) and Hispanic (68.7%) youth. Preliminary results from the July – December 2013 National Health Interview Survey indicate that the number of American homes with only wireless telephones continues to grow. Two in every five American homes (41%) had only wireless telephones (also known as cellular telephones, cell phones, or mobile phones) during the second half of 2013 — an increase of 1.6 percentage points since the first half of 2013 and 2.8 percentage points since the second half of 2012. However, these increases are smaller than those observed in previous years. This report presents the most up-to-date estimates available from the federal government concerning the size and characteristics of these populations. In 2012, the percentages of adults with limitations in activities of daily living and limitations in instrumental activities of daily living increased with age. Louisiana leads the United States in births by cesarean delivery and ranks second in births to unmarried mothers, preterm births and low birthweight. The Bayou State also leads the nation in kidney disease. However, Louisiana has a lower proportion of its population without health insurance than the national average. You are currently browsing the NCHStats blog archives for July, 2014.